Every person has their breaking point. Very few of us ever reach it, but what would we be capable of if we did? This is the question posed by director Werner Herzog in his 1979 film, Woyzeck. The always volatile Klaus Kinski stars as the title character, Franz Woyzeck, a 19th century soldier in the Bavarian army. Woyzeck is a timid man who allows himself to be bullied by his commanding officer (Wolfgang Reichmann), as well as the local doctor (Willy Semmelrogge) who’s conducting medical experiments on him. Each of these two men revel in the amount of torture they can inflict on Woyzeck, who never so much as raises his voice to them. Woyzeck’s live-in mistress, Maria (Eve Mettes), is mother to his son, yet she’s been having an affair with a Drum Major (Josef Bierbichler) in Woyzeck’s company. Upon learning the truth, Woyzeck confronts the Drum Major, only to be humiliated when his romantic rival pummels him in front of several witnesses. Unable to take it any longer, Woyzeck runs into an open field, lies down, and presses his ear to the ground. “Stab”, he says, as if responding to a voice he’s now hearing in his head. His psyche broken, he has come to the disturbing conclusion that Maria must die! As it is with many of his films, Herzog brings a documentary-like feel to Woyzeck, relying on long, uninterrupted takes to present this story of a man who’s been pushed too far. Kinski is tremendous in the role of the troubled main character. Having grown accustomed to seeing him out-of-control in movies like Aguirre: Wrath of God and Fitzcaraldo, I was amazed at how convincingly meek and fragile he was early on. Of course, once the tables are turned, he’s back to being as uncontrollably manic as ever. 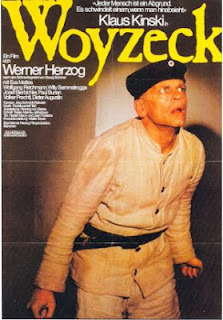 While Woyzeck is not nearly as well-known as some of their other collaborations, Herzog and Kinski do their part to make it a successful one.